Fully synthetic 5W30 engine oil for gasoline LPG and diesel engines in passenger cars and light commercial vehicles equipped with a particle filter to meet Euro-4 emission standards. The Lube1 Full-Synth 5W30 was specially developed for passenger cars and light commercial vehicles of the VAG Group (Volkswagen, Audi, Seat and Skoda) and is suitable for very long oil change intervals (up to 30,000 km for petrol and 50,000 km for diesel engines). Lube1 Full-Synth 5W30 provides extremely fast and stable lubrication during cold start and ensures a very stable lubricating film at high operating temperatures. Thanks to state-of-the-art additives, friction is reduced to a minimum under all operating levels. Fully synthetic 5W40 engine oil for gasoline and diesel engines in passenger cars and light commercial vehicles. It can be used in cars with turbocharger, catalytic converters, particulate filters and / or direct injection systems. Lube1 Full-Synth 5W40 has been developed with state-of-the-art additive technology. The optimized SAPS (sulphated ash, phosphorus, sulfur) reduction significantly extends the service life of the diesel particulate filter and ensures trouble-free operation of the exhaust gas purification system. The Lube1 Full-Synth 5W40 was specially developed for passenger cars and light commercial vehicles of the VAG Group (Volkswagen, Audi, Seat and Skoda). It is ideal for VW diesel engines with pump nozzle technologies (PDI / TDI) and for engines for which VW 505.01 engine oil is prescribed. 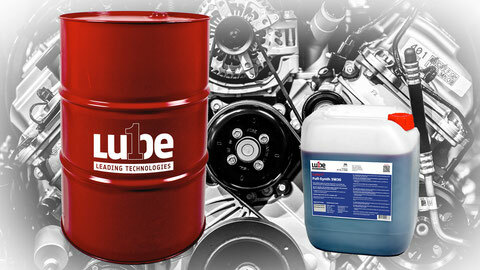 Lube1 Full-Synth 5W40 is also recommended for all Ford engines for the Ford M2C-917A engine oil. Due to the optimized SAPS technology, it can also be used for Euro 4 cars from Mercedes Benz and BMW equipped with particle filters.